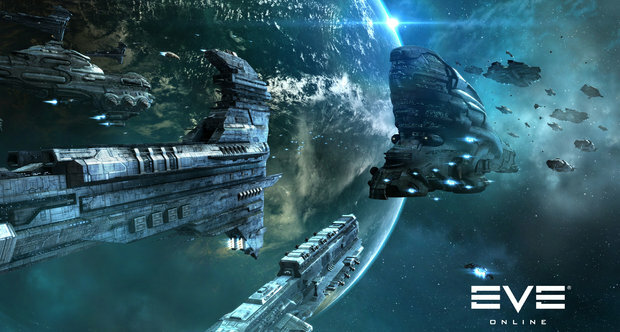 EVE Online screenshot. Image Source: Shack News. See EVE Inferno trailer (2012) here. On Tuesday, Sean Smith, a Foreign Service Information Management Officer assigned to the American consulate in Benghazi, Libya, typed a message to the director of his online gaming guild: ”Assuming we don’t die tonight. We saw one of our ‘police’ that guard the compound taking pictures.” The consulate was under siege, and within hours, a mob would attack, killing Smith along with three others, including the U.S. ambassador. In his professional and personal life, Smith was a husband and father of two, an Air Force veteran, and a 10-year veteran of the Foreign Service who had served in Baghdad, Pretoria, Montreal and The Hague. But when gaming with EVE Online guild Goonswarm, he was a popular figure known as “Vile Rat,” and alternately as “Vilerat” while volunteering as a moderator at the internet community Something Awful. Smith’s death was confirmed on Wednesday morning by the State Department and reported widely in the news media. But the first people to report Smith’s death were his friends. Their reaction was shock and mourning. Mr. Smith's death is mourned tonight by an online community whose members knew him well; he had in fact built up whole virtual realities, based on his real world diplomatic and IT skills. He was talking to his online community just hours prior to his death, and his death was confirmed on online forums. This dimension of the terrible 9/11 story in Benghazi may sound unearthly, inappropriate, dislocated from the religious strife and political manouvres that surround a violent, deadly, sad and disturbing incident. The real world priorities here demand attention to personal loss and grief; to strategic liabilities; to the causes and consequences; to the evolving context and perspectives in the Middle East. Vile Rat, Sean Smith, my friend for over six years, both in real life and in internet spaceships, was the “State Department Official” killed in Benghazi by a mob of religious lunatics, who had been incited to violence on this September 11th by a movie that was apparently made sometime in July. Obviously, given the combined attacks in Egypt and in Libya, this was a coordinated act designed for maximum media exposure; rile up a mob, point them at an embassy or consulate on 9/11 in particular, aim for the press. Many were injured in these pointless, reprehensible acts, and one of my closest friends was killed as a result. If you play this stupid game, you may not realize it, but you play in a galaxy created in large part by Vile Rat’s talent as a diplomat. No one focused as relentlessly on using diplomacy as a strategic tool as VR. Mercenary Coalition flipped sides in the Great War in large part because of Vile Rat’s influence, and if that hadn’t happened GSF probably would have never taken out BoB. Jabberlon5? VR made it. You may not even know what Jabberlon5 is, but it’s the smoke-filled jabber room where every nullsec personage of note hangs out and makes deals. Goonswarm has succeeded over the years in large part because of VR’s emphasis on diplomacy, to the point of creating an entire section with a staff of 10+ called Corps Diplomatique, something no other alliance has. He had the vision and the understanding to see three steps ahead of everyone else - in the game, on the CSM, and when giving real-world advice. In such a context, the role virtual reality played in the life of one of America's diplomatic staff members must seem to the uninitiated to have been at best a foolish incongruity, at worst a security risk. What stands out to me is the wild overlap and deadly junction of two completely different worlds. US Benghazi Consulate on fire, 11 September 2012 © RT. Video Source: Youtube. Is the inner lingo of this gaming world incomprehensible? Does it seem odd that an American IT professional at an important post would be engaged in gaming forum chat just prior to his death? In a dangerous job, or in a frightening situation, it actually makes sense that Mr. Smith would turn to an online community, a group of friends who would be with him, no matter where he was, and no matter what he was facing. Consider that everyone active online is shaped by the virtual communities they now inhabit and is influenced by the virtual friends they make. Consider that the entire Benghazi incident and related attack on the US embassy in Cairo were sparked by violent reaction to a Youtube video of an American film negatively depicting Muhammad and the Islamic religion, which was then denounced on Egyptian television. There is some confusion in the American MSM over the video which precipitated this incident. HuffPo: "entitled Muhammad's Trial, the film, which was widely circulated on YouTube, depicts a mock trial of the prophet, and is reportedly linked to controversial Florida pastor Terry Jones, who gained notoriety in the US and throughout the Muslim world for threatening to burn a Koran." Meanwhile, The Atlantic claims that the film that acted as catalyst is entitled: Innocence of Muslims. Another site suggests that a Dutch film was the initial offending piece of media. Youtube has now blocked users in Libya and Egypt from seeing the unspecified offending video; Google has implemented the same regional block with Innocence of Muslims, but otherwise has maintained search results for the video online. Afghanistan has just banned Youtube in its entirety. Regardless of which film sparked the deadly attack, Time comments that the film is a product of one bigoted religious fundamentalism confronting another at the other end of the earth. What unites them in seconds? The Internet. What drives their virtual confrontation into the realm of nearly uncontrollable real world strategic nightmares? The manipulation of digital media. To get to the bottom of what has happened, The Atlantic has drawn up a social networking and media timeline of communications surrounding this incident, including conciliatory tweets about religious freedom coming from the American Cairo embassy, in which IT embassy staff apparently attempted to offset a violent Egyptian demonstration and attack. People on all sides of these conflicts and questions are inhabiting two worlds. It is not a world of two religions, or two spheres of geopolitical influence. It is a world of the unreal versus the real. The power balance hinges on who can make the virtual dynamic real with greatest speed and greatest effect. Tonight, the gamers who learned real world diplomacy and strategy from Sean Smith in their virtual gaming suite remember him as an "influential intergalactic diplomat in a sprawling virtual galaxy." And tonight, the entire real world diplomatic balance of the Middle East is in strategic upset.